Qlipr: simple, efficient and above all sustainable! The Qlipr crop clamping system - which consists of a galvanised crop hook and two stainless steel clamps - has already earned a strong position in the cucumber and tomato cultivation sector as more than 12 million Qlipr clamps have already been sold worldwide. A tour at some 'Qlipr tomato growers' shows that the system can be used with all cultivation methods, it is easy to use and it cuts down on the work required. But perhaps most telling factor is that Qlipr is very sustainable! “Flavourwave Katunga cultivates tomatoes on 5.3 hectares, with 4.3 hectares used for loose cherry tomatoes and 1 hectare for vine cherry tomatoes. This is now the second season that we have been using Qlipr. I began working here as the company director three months ago, so I only recently started learning how to use the system. By using Qlipr, Flavourwave hopes to be able to work in a more sustainable manner and to cut back on labour. The latter has already been achieved as pinching of side shoots, winding and lowering can now be done in one go. We move the clips every week, but in winter we might only have to do that once every ten days. At our company every clipper is responsible for eleven rows of their own and they get paid by the row. On average employees 'do' about 600 plants per hour, but that number could go up a bit because we added a shoot during this past week. In addition to the labour and sustainability gains another great advantage, considering that we also cultivate in winter, is that we can get all of the terminal buds nice and even. This allows for better light distribution among the plants. There are also no hooks hanging above the plants that cut down on light penetration. It is also important to note that the Qlipr method is fairly easy to learn, so new employees can master it quickly, without causing too much damage to the crop. There are some disadvantages as well, however: Clips occasionally jump from the hook because we pollinate by beating with sticks on the crop wires and it costs a bit of time to put the clips back up again. All in all Qlipr certainly has potential, especially where trained staff is in limited supply - as is the case here in Australia." "We grow many types of products in our organic horticulture business - in fact we cultivate nearly fifty different types of vegetables. We sell them directly to consumers in our own store, as well as to health food stores, restaurants, organic delivery services and caterers. 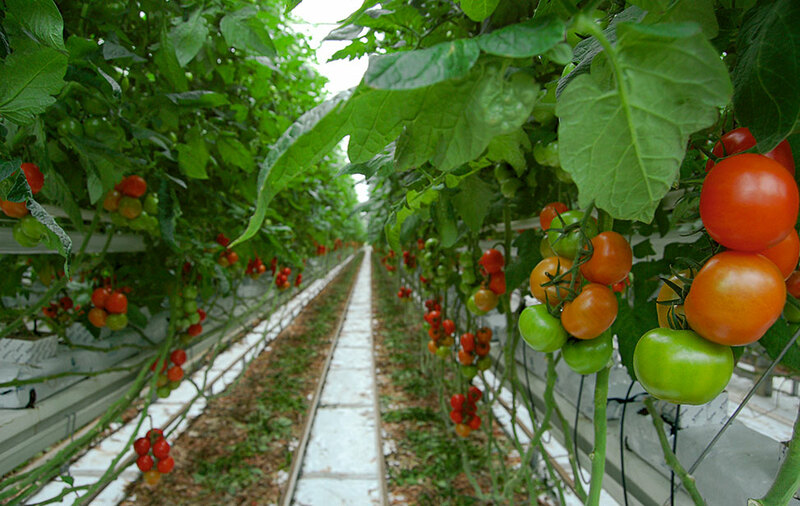 Tomatoes form an indispensable part of our crop plan and we have dedicated 1600 m2 of greenhouse space to tomatoes. Until recently we grew them in the traditional manner as we trained the plants along a rope up to the crop wire, which is suspended at a height of 2.70 meters. Since the beginning of May we started using the Qlipr system on two hundred plants to see if it would work. We consider the labour reduction that we have gained through Qlipr to be significant. We go through the crop every second week we combine lowering, pinching of side shoots and hanging in one go. Since we already use biologically degradable rope we have not gained much in term of sustainability, but we have noticed that the plants are clearly more stable since we started using Qlipr, which is a significant advantage."